Joseph Krauss of Associated Press provides the following background to the current conflict: “Inspired by the Arab Spring uprisings sweeping the region, Libyans rose up in February 2011 against Gaddafi, who responded with a fierce military crackdown. As the uprising quickly escalated into a civil war, Gaddafi massed tanks outside the eastern city of Benghazi and threatened to massacre the protesters street by street. NATO responded with a bombing campaign against Gaddafi’s forces, and eventually provided close air support to a loose alliance of rebel militias, helping them to drive him from power. The rebels captured Gaddafi in his home city of Sirte in October 2011 and killed him, later releasing video footage of him being beaten and humiliated. According to Agila Saleh, head of Libya’s east-based parliament, Tripoli is being hijacked by militias that threaten the freedom of Libyans. 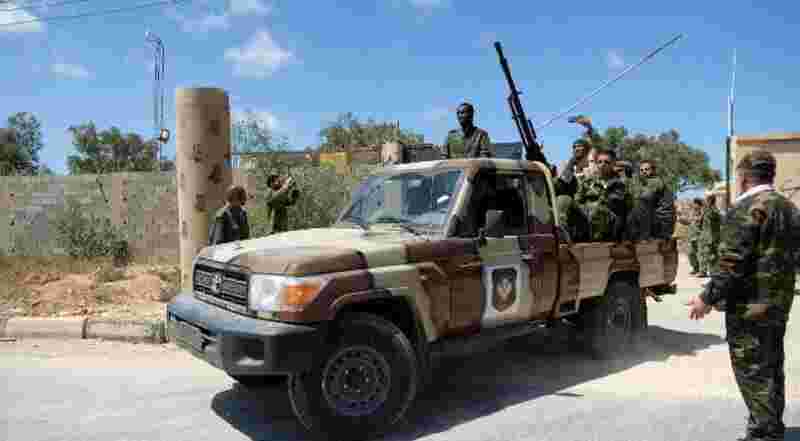 “The Libyan army moved towards Tripoli with one goal, to free Tripoli from armed militias,” he said after meeting with the Arab League’s secretary-general, Ahmed Aboul Gheit. Hifter, after the first Libyan civil war that saw the defeat of the Gaddafi regime, is known for his military operations throughout the country, trying to rid it of terrorists and extremists that seek to use Libya as a hideout while perpetrating terrorist attacks elsewhere. Libya, however, is paying a price. When the Taliban in Afghanistan helped hide Osama Bin Laden after the 11 September attacks on the United States, Afghanistan became an international warzone as the US military, together with its NATO allies, invaded the country. Even after the defeat of the Taliban, the election of a new government and the death of bin Laden in Pakistan, the US military still engaged in combat operations in Afghanistan. In many ways, Libya is suffering a similar fate, with terrorist groups using the country as a haven. The US, together with NATO forces, have been operational in Libya since its 2011 intervention. After the defeat of Gaddafi, the US continued military operations under the guise of the ‘war on terror’ endorsed by former US president George W. Bush in 2001. The Islamic State, under heavy aerial bombardment from the US in Iraq and Syria, fled to Libya where it is now ‘breathing its last’ as the US and military forces under Field Marshal Hifter continue to strike. The ‘Arab Spring’ opened a door of opportunity for the spread of the Gospel like never before, and the brutality of the Islamic State – that founded its ‘caliphate’ on the back of the revolution – added further opportunities to share the Gospel with millions of Muslims. The Church in the Middle East made the most of the ‘Arab Spring’ and resulting wars (in Tunisia, Libya, Syria and Yemen) to share the good news of Christ with Muslims who were questioning their leaders and even their religion. The war in Libya has opened up similar opportunities. However, according to Church leaders in the region, the harvest could have been much greater had the Church in the West been more prepared to help. The war in Syria – that forced more than five million people to become refugees – is drawing to a close, and with it, wider opportunities to share the Gospel. Libya serves as a gateway for African migrants wanting to cross the Mediterranean to Europe. More than seventy percent of all migrants hoping to reach Europe from North Africa use the Libyan coast as their last step before seeking asylum in Europe. The flow of migrants has also opened opportunities for the Gospel, and whether migrants are reached on their way to Europe, or in countries like Germany where thousands have accepted Christ, opportunities to share the Gospel increase with every new migrant who starts their journey. The increased fighting in Libya has unfortunately placed migrants in the crossfire, with many being killed or captured. Will the current escalation in fighting, and the possibility of large-scale war, once again open the doors for the Gospel, or will this particular opportunity be lost by an unprepared Church?